It’s official – either Eliezer, Four or Iziqhaza will become South Africa’s next singing sensation, following a hard-fought semi-final gala show in which Wandaboy became the latest X Factor South Africa act to be eliminated. The much-anticipated moment of truth will arrive on Saturday, 13 December on SABC1, when the top three will slug it out in song to determine who will be South Africa’s first-ever X Factor winner. The three finalists will have to muster every single ounce of talent, charisma, guts and sheer will to prove to the public that they possess that rare X factor which could propel them to pop superstardom. That’s right – this time, the judges will have no say in who stays, goes or triumphs. It’s entirely up to South Africans to vote for their first X Factor winner. Heading into the semi-final round on Saturday, 6 December were Oskido’s acts Iziqhaza and Four and Zonke’s solo singers Eliezer and Wandaboy. This was after Bubbles, Arno Carstens’ sole remaining contestant in the competition, was given her marching orders. Coming a year after the death of Nelson Mandela, the four remaining acts also prepared a special rendition of Johnny Clegg’s Asimbonanga in celebration of Tata Madiba – a spine-tingling performance that left barely a dry eye in the house. Perhaps aptly, the theme for the night’s performances was “love and heartbreak”. As host Andile Ncube pointed out, there has been a lot of love for all the contestants but yet another aspiring singer or group’s heart was destined to be broken as their X Factor SA journey came to an end. Having survived last week’s sing-off, the duo of Iziqhaza gave their all to the track Susan by The Soil. Singing Chris Brown’s Don’t Judge Me was Wandaboy – who had never been in the bottom two up until that point. Eliezer took on the beautiful Pray for Me by Anthony Hamilton, after which David, Steven and Jethro from Four poured heart and soul into Stay With Me by Sam Smith. After tugging on the heartstrings, it was time to get down to business. 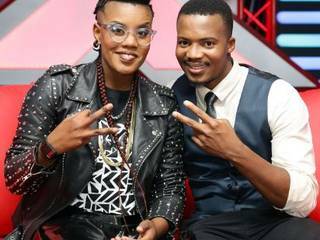 Viewers voted and placed Iziqhaza and Wandaboy in the bottom two, leading to a high-pressure sing-off. The judges then made the agonising decision to send Wandaboy home. Viewers can look forward to a bumper finale show on Saturday, 13 December at 18:00 on SABC1, with the results show at 19:30. It will include special peformances by multiple Grammy Award winners Ladysmith Black Mambazo and the hot summer anthem Koze Kuse by DJ Merlon and Mondli. And of course, the big moment – the crowning of the X Factor South Africa’s very first winner. Don’t forget to SMS through one’s votes to 33121 (SMSes charged at R1.50).